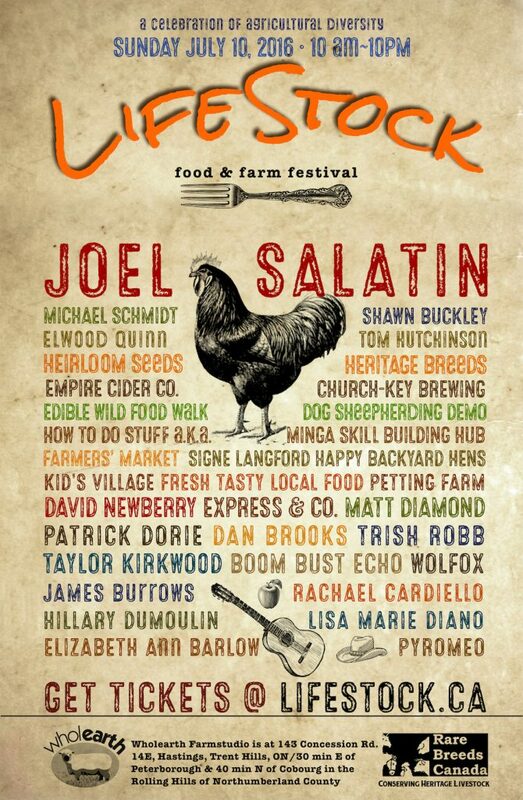 Join us along with outspoken pasture-based farmer/author Joel Salatin, raw milk advocate Michael Schmidt, Montana Jones and other lovers of food, farm and life, to celebrate agriCULTURAL diversity on July 10th, 2016! A FUNdraiser for legal fees for Montana Jones and Michael Schmidt’s upcoming criminal trial after the CFIA killed Montana’s rare heritage healthy sheep. Bring your friends and family for a great day of music, food, skill building, and stewarding the earth with care and kindness, celebrating heirloom seeds and heritage breeds at Wholearth Farmstudio. Empire Cider Empire Cider Co.
First 50 tickets sold out in 2 days. 100 tickets for $20 until April 15th. Buy online and save 25% at the gate. A special rate for our farmers and future farmers. Save big by pre-ordering your tickets online. Be part of the LifeStock team, just register here! After you've filled out the form, complete your registration by making your deposit here, then select the number of booths you require.